One commonly overlooked source of increased revenue is a business’ existing customer base. Taking a look at your business with the goal of finding ways to grow your revenue or shrink your costs is a great way to uncover revenue opportunities. To start, you’ll want to take a good, hard look at your client base and start thinking about like a portfolio—a mix of revenue opportunities made up of different behaviors and benefits. Many studies have shown that by evaluating an existing customer base, a business can use the data to grow revenue without acquiring a single new customer, among other benefits. On a piece of paper, draw two intersecting lines through the middle to divide the page into 4 equal quadrants. The y-axis is going to be your “Satisfaction” line and the x-axis your “Revenue” line. Now, with your client or customer list on a spreadsheet, using two different columns, begin scoring each account 1-5 based on two factors: revenue and satisfaction. 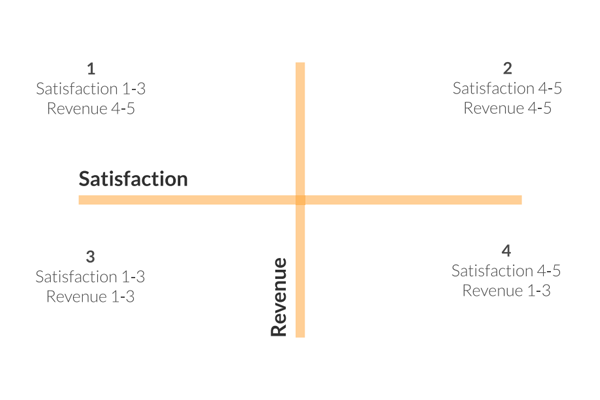 1 is the lowest revenue or satisfaction and 5 is the highest. Now, going back through the list you have scored, each client should fall into one of the four quadrants. Any score of 3 falls into the left or bottom half of the divider. Analyze this group of customers and think about ways you could better serve each of them. Chances are, there is even more revenue opportunity among this complacent group. If you’re unsure of the exact reason for the low level of satisfaction, ask. Customers will appreciate a candid conversation and an authentic attempt to fulfill specific needs. You can’t be everything to everyone, but it might be worth the time and energy to make a small adjustment to keep a high-revenue account. High satisfaction paired with high revenue—these customers are the best of the best. Break this list down into sub-categories and use this information to find similar clients. Source – How did they find you (or vice versa)? Find the similarities in these clients and you’ll find a gold mine of information for coming up with strategic ways to find more customers like them. You may need to ask yourself if you’re already spending too much time on these accounts. This group may be the example of clients not worth signing in the first place. The question you need to ask is: Could the energy I spend on this unhappy and low-revenue client be better spent elsewhere? All customers are NOT created equal—with a limited amount of time and energy in a day, you need to consider what level of effort will needed for the client and the amount of payoff. It’s not worth running around like a mad person to service a small opportunity client. Keep your services consistent unless a high revenue opportunity justifies making changes to win (or keep) the account. Make sure to balance your marketing efforts among small and large accounts (to win other large accounts). You’ll learn a lot from this easygoing client list and with a strong knowledge of your existing customer base, you’ll be able to take advantage of key opportunities while tuning into the most profitable target clients to offer your services.